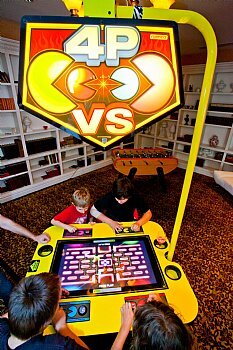 Just like the Pacman arcade game & Ms. Pacman arcade game, players move their joystick up, down, left & right moving through mazes. 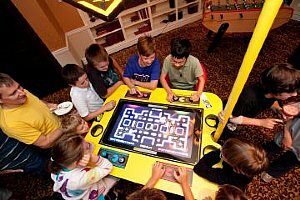 However, the objective of the Pacman arcade game Battle Royale is to chase & devour the other players when the opportunity presents itself. When a player's Pacman finds a power pellet and eats it, that Pacman now grows larger and stays larger for a certain duration of time. During that time period, that player's Pacman can now chase the other player's Pacman and if they are smaller devour them. However, at some point the larger Pacman will shrink back to normal size and if the Pacman that is being chased discover a power pellet nearby then the Pacman being chased now becomes the one doing the chasing. The last player alive is declared the winner of the round. Anywhere from 3 to 9 rounds can be programmed. Currently, for team building events and other parties the Pacman arcade game is programmed for 5 rounds. 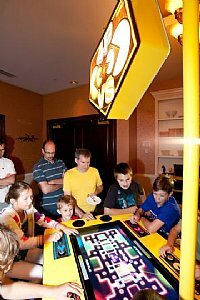 Besides eating other players in Pacman arcade game Battle Royale there are other ways to win a round. One way is to bump your fellow Pacman player into a ghost and then they will be devoured by the ghost. Another way is to play keep away from all the action and let the other Pacman players battle it out. Guests play the Pacman Battle Royale on the comfort of 4 professional stools. However, we have already witnessed some players standing up due to to the excitement of this arcade game. 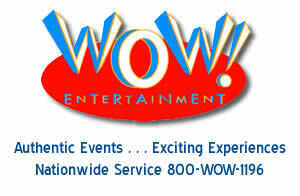 Contact a WOW Entertainment event specialist at 800-WOW-1196 to learn more about the arcade game Pacman Battle Royale and to see if it will be suitable choice for your event.